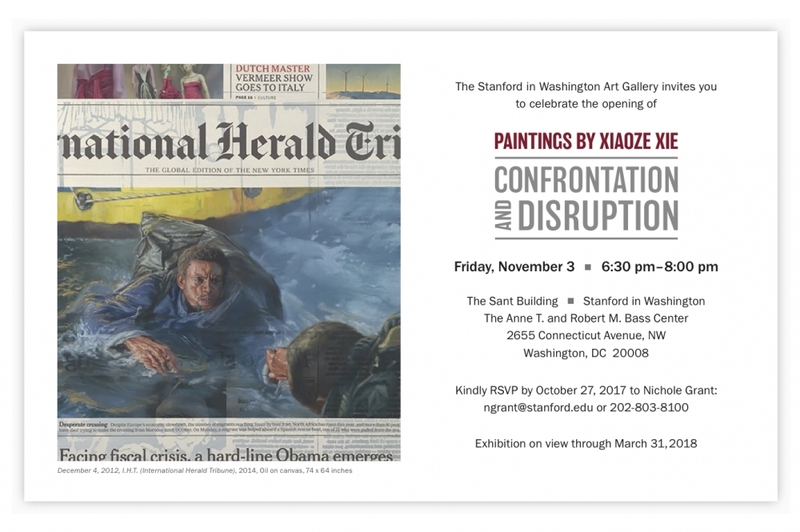 “What is the role of a daily newspaper?” This is the question posed to us in Paintings by Xiaoze Xie:Confrontation and Disruption, the second exhibition of Xie’s work at the Stanford in Washington Art Gallery. A newspaper, often skimmed in a hurry, discarded once consumed, may not immediately strike viewers as art, which is savored slowly, revisited time after time. But Xie transforms news into poetry as he blurs the lines between painter, writer, commentator, and critic. On his canvasses, Xie asks us to consider history and memory, archiving and forgetting, ideology and communication, transparency and transformation, chatter versus substance, fragment and whole. As the United States questions its ideological past and future, Stanford in Washington exhibits Xiaoze Xie’s works at a formative time and fitting place, in the nation’s capital.